Breguet watches are unmistakable for their perfectly rational styling where lines are clean and functions clear. Today Breguet watches carry the pedigree of an original design in sharp, blued-steel hands and the crisp engine-turning of the dial. Watch enthusiasts agree that each Breguet watch represents an exceptional standard of horological art that deserves to be identified for posterity. Since Breguet’s early days, the manufacturing numbers of its watches have enabled collectors to confirm their origin and provenance. In keeping with tradition, the unique production number assigned to each Breguet watch will testify to the talent and the care of its manufacture for generations to come. Their success soon made Breguet watches a tempting target for counterfeiters. In1795, Breguet came up with a counter-measure, the secret signature. 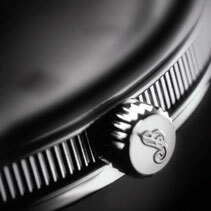 Etched into the dial, the signature is all but invisible, unless the dial is examined in oblique light. Still a token of authenticity today, the secret signature has remained a feature of most Breguet dials down to the present. An engine-turned dial is indisputably a true work of art. Around 1786, Breguet began fitting his watches with engine-turned silver or gold dials of his own design. The craft of carving recurring patterns in metal is rare today, but remains one of the details that identify Breguet watches. Manually engine-turned, the dials are celebrated for fitness of their patterns, reflecting the regularity of the movements within. 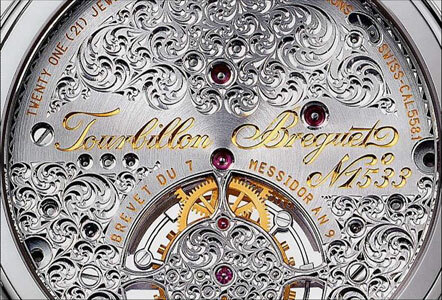 Breguet watches have transparent casebacks to reveal the complexity and finish of the movement, the soul of the watch. Breguet watches have featured its founder’s celebrated hollow, eccentric ‘moon’ tip watch hands for over two centuries now. Designed around 1783, his slim, sleek hands proved an instant success and the expression ‘Breguet hands’ soon became a common watchmaker’s term. 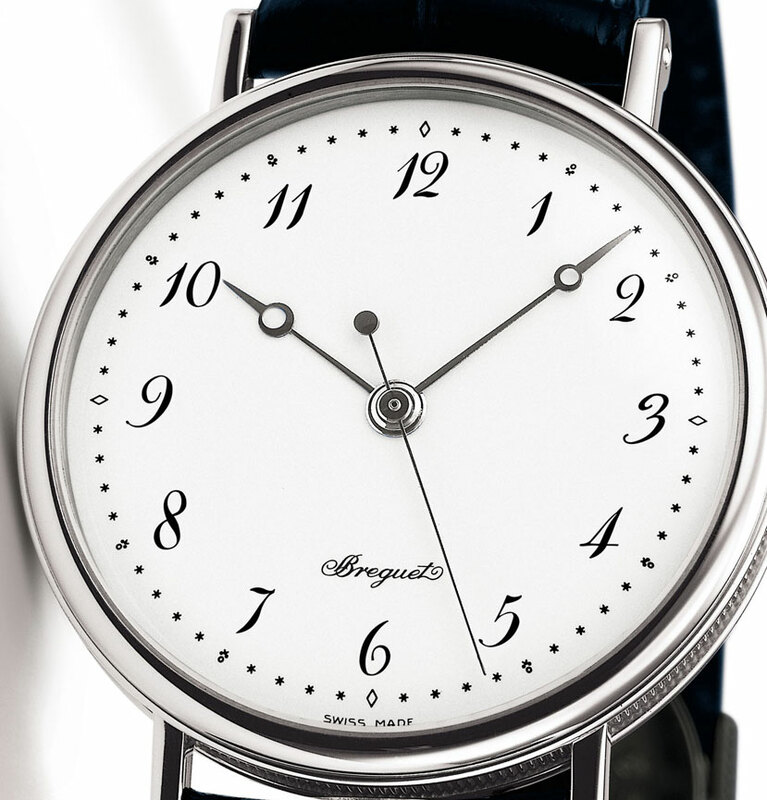 Simple and easy-to-read, they are found on most Breguet time­pieces and have been widely imitated by others. Unadorned, except for the celebrated hole near the tip, the hands bear the name of their designer. 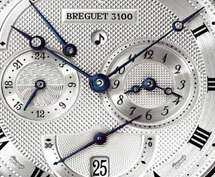 Some Breguet watches display the distinctive numerals that AL Breguet designed. Although he himself was no calligraphist, Breguet’s Arabic numerals show his flair for combining function with elegance. Still used today, particularly on watches with enamel dials, Breguet numerals first appeared before the French Revolution when they shared the dial with tiny stars to mark the minutes and stylised fleur-de-lys at five minute intervals. By 1790, they had assumed their definitive form. Although essential only to wristwatches, the lugs that link the strap to the case bear all the hallmarks of authentic Breguet styling. Screw-pins, rather than the more usual spring bars, hold the strap between the horns, a solution that is not only better looking but also more secure. The lugs have to be welded onto the caseband as much for the technical reasons of rigidity and strength as for aesthetic consistency. Equally exacting is the drilling of the hole for the winding stem. Only absolute precision ensures a watertight case. The fluting (fine grooves enhanced with double beading) on the caseband of Breguet’s watches is another of the discreet decorative details that constitute what has become known as the Breguet style. In common with many period Breguet timepieces, most of the modem wristwatches have fluted casebands — one of the features that set them apart from other watches The fluted pattern is cold-rolled into the caseband, then finished by hand on a mechanical work-piece holder. 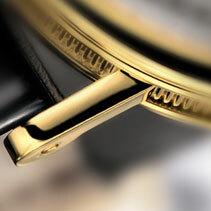 Fluting on the caseband, bordered by mouldings, guarantees the authentic Breguet watch.